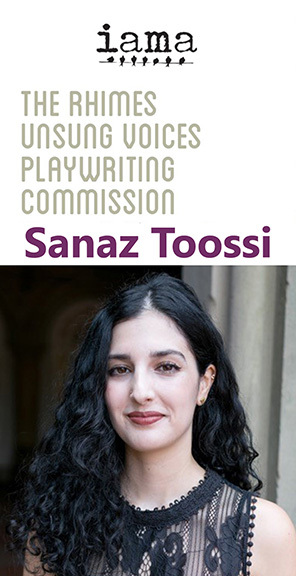 LOS ANGELES (Jan. 10, 2019) — IAMA Theatre Company has named playwright Sanaz Toossi as the 2019 recipient of the Rhimes Unsung Voices Playwriting Commission. The commission, sponsored by award-winning writer and producer Shonda Rhimes (Grey’s Anatomy, Scandal, How To Get Away With Murder), was created to help grow and nourish budding playwrights and artists with emphasis on cultural inclusion and the goal to showcase fresh, creative, thought-provoking work. This is the second year of the commission. Last year’s recipient, Geraldine Inoa, recently made her professional playwriting debut with Scraps, which was presented by New York’s Flea Theatre as part of its 2018/19 season. She is currently writing for AMC’s The Walking Dead. Toossi is an Iranian-American playwright from Orange County, CA. She received her M.F.A. in playwriting from NYU’s Tisch School of the Arts, where she received the John Golden Award for excellence in playwriting. Her short play Baba Karam was read at the Atlantic Theater, where she is the recipient of the Launch commission. She is a member of Youngblood at Ensemble Studio Theatre and the Clubbed Thumb early career writers’ group and was a P73 playwriting fellowship semifinalist. She is a proud child of immigrants. According to IAMA co-artistic directors Stefanie Black, Christian Durso and Katie Lowes, the Rhimes commission helps foster long-lasting relationships with the diverse voices the company is committed to developing. By incorporating the talent and inspiration of IAMA’s acting ensemble into the development of writers and their work, IAMA continues to create a growing and dynamic family of artists. IAMA has been dedicated to developing plays and musicals by new, emerging and established playwrights since 2007. Rhimes, a frequent IAMA audience member, came on board in March 2017 as the company’s first-ever “Patron of the Arts,” committing funds for the commission through her Rhimes Family Foundation. Designated by Playbill as “one of 20 regional houses every theater lover must know,” IAMA Theatre Company is a Los Angeles-based ensemble of artists committed to invigorating live performance for a streaming generation. Through cutting-edge, cool and hyper-modern stories, IAMA is invested in the immediacy of production and strives to bring audiences out of their personal space and into a shared experience. Plays generated at IAMA have traveled to off-Broadway, Second Stage and the Roundabout Underground, and have been performed regionally and internationally. IAMA members have been featured in numerous critically acclaimed TV shows and films as well as in a vast array of theater and live performances all over the country; this fall, IAMA co-artistic director Katie Lowes and her husband, IAMA marketing director Adam Shapiro, made their Broadway debuts in Waitress. IAMA earned the Ovation Award for Outstanding Play in an Intimate Theatre for its Los Angeles premiere of The Recommendation. In 2017, TV producer and creator Shonda Rhimes announced that she would become IAMA’s first-ever “Patron of the Arts” with a generous endowment from the Rhimes Family Foundation. The Rhimes Family Foundation was established in 2016 by writer/producer Shonda Rhimes and her family. The foundation was created to support arts, education, and activism with a focus on promoting cultural inclusion, fighting for equality and standing up against bigotry of any kind. For more information about IAMA Theatre Company and the Rhimes Unsung Voices Playwriting Commission, call Lucy Pollak (818) 887-1499 (media only) or go to www.iamatheatre.com. For more information about Shonda Rhimes and The Rhimes Family Foundation please contact: Kristin Robinson at 323-499-4800 or kristinr@shondaland.com.